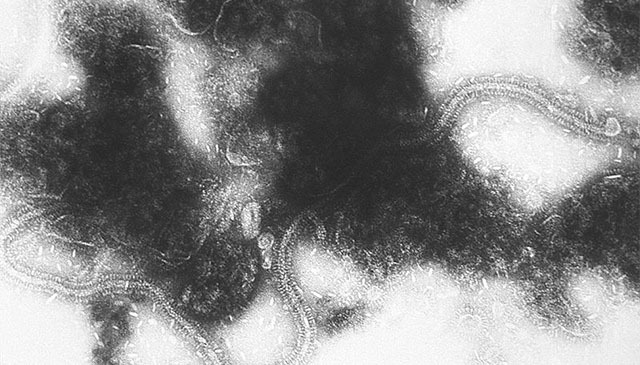 For at least one man, it looks like this virus, RSV, might have set off his type 2 diabetes. Electron micrograph image courtesy of Wikimedia Commons. Some of the most interesting findings in science happen on fishing exhibitions. No, I don’t mean going out on a boat (although lots of cool things have been found that way); I mean just gathering lots of data and seeing what you can find. Something really interesting came out of just such a project from the lab of Dr. Mike Snyder at Stanford University. He set out to study himself in every way possible over a period of a few years. His lab looked at his DNA, how his DNA was being used, what sorts of things were in his blood, what his immune system was doing and lots more. His lab also then determined how these things changed over the course of the experiment. One of the most fascinating things to come out of this study so far was actually a bit of a lucky break (for science, not for Mike). Over the course of the experiment, Mike developed type 2 diabetes. And not only did we get to pretty much watch this happen in real time, but we also got to see that it might have been caused in a totally unexpected way—a respiratory syncytial virus (RSV) infection. 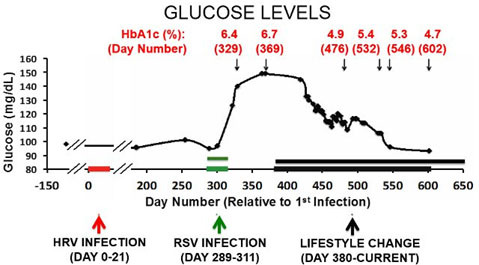 To my knowledge, this is the first time the progression to type 2 diabetes has been seen to be caused by a virus and also seen in such detail. There is a lot going on here so let’s break it down. We are graphing Mike’s glucose levels over time and indicating when he developed viral infections and when he changed what he ate and how much he exercised (“lifestyle changes”). In addition, his HbA1c numbers are indicated at various times. This is a measure that gets at what his glucose levels were like over the previous three months (above 6 is trouble). A person is diagnosed with type 2 diabetes when his or her fasting glucose levels get above 125 mg/dL (and a person is deemed prediabetic if his or her levels are between 100 and 125). As you can see, Mike’s glucose levels are a little high but he is not even prediabetic. He might be flirting with it around day 250 but then his glucose levels come back down. Then, around day 325, his glucose levels suddenly shoot up. He is now officially diabetic. His glucose levels continue to be high for a long period thereafter. This sudden spike is not how most cases of type 2 diabetes are thought to happen. The usual line is that a person’s cells slowly become more resistant to insulin which makes that person’s pancreas slowly increase its insulin production. The patient’s cells need more and more insulin to get the job done. After a while, the pancreas tires out and can’t keep up with the ever increasing amounts of insulin the cells demand. 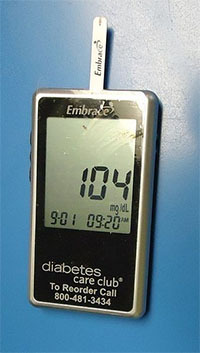 The result is that the patient’s glucose levels are less and less under control until type 2 diabetes develops. This is thought to be a slow, steady process. All cases of type 2 diabetes might not happen in the same way. Image courtesy of Wikimedia Commons. Mike’s diabetes did not follow this path. Instead of slow and steady it appeared pretty suddenly, right after a severe cold caused by an RSV infection. It certainly looks as if the viral infection did something to his body that caused his pancreas to no longer be able to make enough insulin. His lab was also able to see some major changes in how his genes were being used and what was in his blood right after this infection, as his type 2 diabetes was developing. The major changes were in pathways responsible for regulating his insulin levels. Something happened that caused his insulin regulation to go completely out of whack which is probably behind his rising glucose levels. At around day 380, Mike radically changed his diet and exercise to try to bring his glucose levels back under control. He cut out all sugars and began to bike regularly. As you can see, his glucose levels started dropping by day 430 or so and continued to drop until they returned to normal. His diabetes is now under control. We don’t know why this worked so well in Mike’s case. It may have been so effective because he was able to catch his diabetes so early or maybe because of how his diabetes developed or for some other reason. We also don’t know how common it is for a virus to cause Type 2 diabetes. Most people have doctor’s appointments every few years (and some of us even less often!) and so they might miss a sudden spike like this in their glucose levels. 3) NOT have major organ disease, active eating or psychiatric disorder, be pregnant or lactating, have heavy alcohol use, or use medications known to alter blood glucose. 4) Be highly motivated, given the fact that the study is for at least a two-year period and asks for a strong commitment to give blood samples every three months plus more often when they are sick. If you meet these criteria, then you will undergo a set of additional medical tests (like glucose tolerance for instance). If you make it through these, then you can officially join the study. Lucky (?) for me, I meet all the criteria and so I joined the study last week. Let me tell you, they are not lying about the motivation! Not only do they take what seemed an awful lot of blood, but they are also looking at the microbiomes (the bacterial populations) of various parts of my body. That means stool and urine samples and swabs from behind my ear, up my nose and from the top of my tongue. Yes, it is invasive but worth it (at least to me). I love getting this constant stream of data and learning more about what my DNA says about me. I can also see what changes in my diet or exercise do to my glucose levels or if cinnamon actually helps control blood sugar and whatever else I can think of. Plus I get my DNA sequenced and get to help in gaining a better understanding of diabetes. Definitely a win-win for me. And this won’t be the last of these studies. Mike will continue to plumb the depths of what it is to be Mike Snyder and so will keep getting poked and prodded for years to come. Undoubtedly lots more interesting findings are in his and our futures. This is really the start of the future of medicine. Through these studies we’ll learn what we need to test and how often based on a patient’s genetics and whatever else they find is important. This is just a baby step on the road to personalized medicine but at least we are on our way.